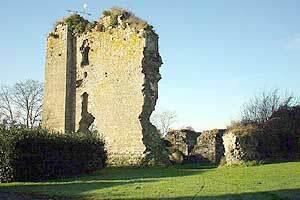 Old medieval fortress, renovated between 1450 and 1470 per Jean de Derval remain of significant vestiges. It counted 6 turns, a châtelet of entry with a bridge levis and the home seigneurial. The oldest part is consisted the chorus of the vault castrale of Romance style (XIIIe). Four turns are still drawn up: the keep (XIIIe - XVe) century in the beginning independent of the castle, high of 38 meters; the tower of the Clock (XIVe-XVe) was used as belfry during Ancien Régime; the turns of Guet and the Cardinal (XVe) were undoubtedly built by Jean de Derval and preserved their covered way on machicolation. Casteland.com particularly thanks Patrice Bonjour see web site 35630 Hédé for the photographs and text.